For many couples, wedding cakes are the centerpiece of their reception. If you don’t already have a clear idea of what you want your wedding confection to look and taste like, you can draw inspiration from just about anywhere. The details in your wedding dress, a love note your fiancé wrote to you or the garden you just planted at home together can all serve as sources to awaken your creativity. When designing your wedding cake, we have a few suggestions, trends and tips that might help make your decision easier. Don’t rule out the possibility, however, that inspiration can come from anywhere. If it’s something meaningful to you and your partner, you can’t go wrong. 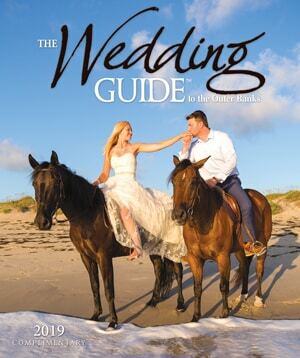 If you’re planning an Outer Banks ceremony and reception, consider letting the wild beauty of the coast, the deep, colorful sunsets, and the carefree island mentality inspire your design and radiate through your sweet centerpiece. Design a cake that will reflect your personal style as a couple, the theme of your wedding, or the beautiful venue you have chosen for your nuptials. We know it’s a big decision, and that is what we’re here for. Take a look at these wedding cake trends for 2017 for some ideas and tips and then put your personal spin on our suggestions to construct the wedding cake you’ve always dreamed of! Determining the boundaries you have for your cake is the first step. Setting your budget and choosing your venue are the best ways for you to begin. Once you have these two important decisions made, you will have a better idea of the options available to you when choosing your wedding cake. Discuss your budget with local wedding cake professionals and ask for photos of their previous creations. Show photos of your gown, decorations, venue and anything else that will give them a sense of who you are and the atmosphere in which your cake will be the centerpiece. Your venue will also be a key factor in determining some of the decisions you make. 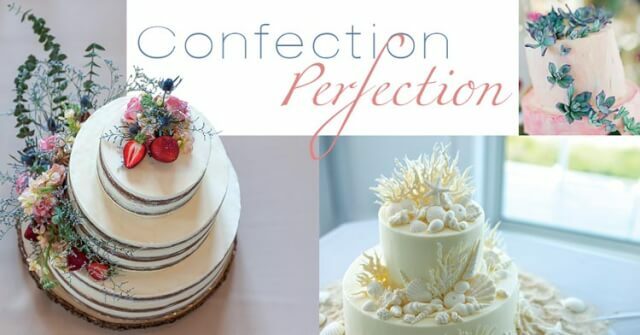 If your reception is on the beach during the summer, temperatures are likely to reach 80 degrees or higher, so you’ll want to steer away from buttercream, whipped cream and meringue toppings, as they will create a runny mess in the heat. If you do opt for an outdoor summertime party after your ceremony and wish to incorporate one of these toppings, leave the cake indoors or in a cooler for as long as possible, and then bring it out just in time for toasting and serving to preserve your cake’s delicate details. 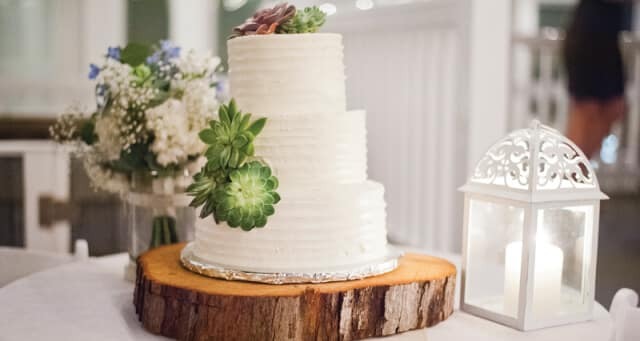 Some cake and icing ingredients hold up better than others in the heat, so ask your baker about different options if this is a concern for your summer wedding. Fondant-covered cakes withstand higher temperatures and maintain their shape and appearance from the first slice to the last bite. Many people prefer the sweet taste of buttercream to fondant, but the choice is yours. If you decide on fondant, discuss with your baker ways to make it as thin as possible while keeping the same results, and opt for a buttercream filling to enhance the taste. Another aspect to consider when assessing the limitations that affect your wedding cake decision is the accessibility of the location in which you are hosting your wedding. 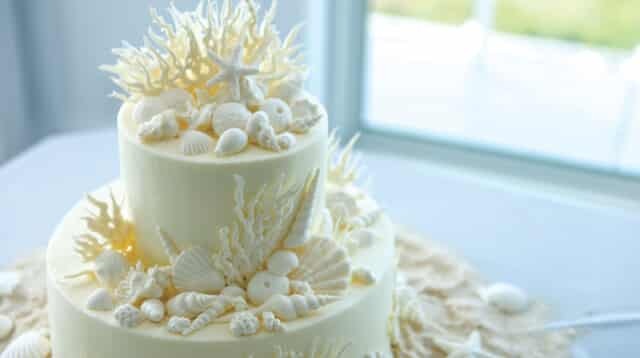 If you are planning a wedding in the 4×4 beaches, for example, or another not-so-easily accessible locale, the transportation of the cake will become more of a challenge. A cake with meticulously placed tiers will not absorb the bumps and bounces of off-road driving as well as a smaller, simpler design might be able to withstand. Choose a more durable cake that is not in danger of toppling over, or ask your cake maker to assist you in transportation arrangements, perhaps scheduling to have it brought to you in parts and put together when the baker arrives if possible. When the time comes, if disaster strikes when it comes to your cake, maintain your state of grace and focus on the reason for the day. Because, after all, in the long run, the love is what remains, and any wedding-day mishaps will only make for a humorous story at your 50th wedding anniversary party. Now this is where it starts to get tasty. Over the past few years, offering a different, yet one-dimensional flavor for each tier of the cake was a popular option, but that changed in 2017. The single luscious, exotic flavor combination for the entire cake is making waves with the wedding crowds. Use this tasty trend to celebrate your roots, your foodie flair, or the “heritage” of your hometown with flavors reminiscent of places, times, people, and memories. Are you a Southern girl at heart? Red Velvet cake with cream cheese frosting evokes a mood nothing short of a scene straight out of Steel Magnolias. Did you and your fiancé get engaged in the islands over pina coladas? Choose a coconut cake with a key lime buttercream filling and smile at each other upon first bite, remembering that special night that led you to this memorable day. Innovative concoctions like this will have everyone guessing and discussing the flavors as if they were food connoisseurs themselves, and then get ready for oohs and ahhs when you explain the heartwarming reason behind your flavor decision. Whether you want a dramatic masterpiece of varying shapes or you prefer a simple one-tier design, options abound this year. One-tier wedding cakes are entering the scene as a popular look for low key, outdoorsy couples. Often decorated in rustic, unfinished ways, one-tier cakes contain many layers, enough to feed guests at a small wedding, and can help keep your budget at single-level too. These sweet and simple stacks are perfect for brides who have chosen a more pragmatic approach, and the “less is more” take on the cake can be a simple work of absolute beauty. On the other end of the confectioner’s spectrum, big cakes still reign supreme. Multi-layer statement cakes in four, five and six tiers can be matched to whatever personality or theme you choose. These fit-for-royalty comeback cakes are standing out in metallic buttercreams, ruffles, sequins and lace. Also popular in 2017 are varying cake shapes, stacked within tiers of alternating square, round and you-name-it shaped cakes. Delicate hand-painted floral patterns crafted upon sleek fondant create an antique sense of whimsy this year. There is no need for adornments with this edible piece of art. Another popular trend is for couples to display their personal style through hand-painted work reminiscent of a groom’s cake. Intricate artistic creations, favorite literary or Hollywood characters and scenes can create a sweet, fun-loving cake to represent the couple’s convivial attitude or personal love story. Opt out of a cake topper this year and choose a sophisticated design or decoration situated along the tiers instead. Many couples are choosing a polished look with a smooth top rather than selecting a cake topper. Tiers featuring cascading flowers, either sugar or fresh and edible, are prominent. Remember, if you are using fresh blooms, double check with your florist to ensure that the flowers have not been sprayed with pesticides and are truly edible. If you are building the cake of your dreams on a budget, substituting fresh berries will add color and flare to your cake. Baroque metallic adornments or hints of lace that are reminiscent of this year’s wedding gown trends also make for stunning accent pieces that are bold enough to stand without a topper. Still like the idea of situating something atop your reception confection? Have your cake and eat it, too. Written inspirations like, “The best is yet to come,” “Happily ever after,” and “Always & Forever,” in metallic cursive or bamboo lettering can add an elegant finish to your cake while avoiding the traditional figurine topper. Skip the sweets bar and dessert table this year and do like many other 2017 brides are doing…serve your cake as the dessert. Previously, weddings have displayed sweets tables, decadent cake pops, color-coded candies, and cupcake tiers, among other treats. 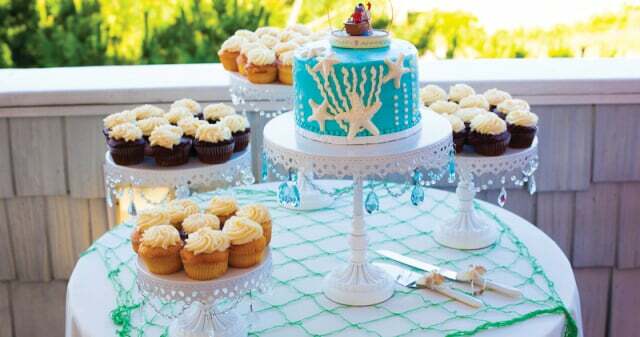 Many beach brides will opt for a simpler approach and serve the wedding cake as the meal’s grand finale. 2017 is an exciting year to choose a wedding cake! Where new flavor combinations pop, traditional tastes still hold their own. While towering tiers make lasting impressions, so do single-tier rustic cakes, or better yet, cakes that aren’t even cakes at all. You can tie in the overall theme and color scheme to your decadent centerpiece, have it stand alone as an eye-catching conversation starter, or simply have it serve as a direct reflection of you as a couple…in sugar form. No matter how you choose to incorporate the cake into your reception, choosing something you love that represents you is always the best way to go. 10. Chalkboard Cakes: Personalized, hand-drawn details are sure to warm hearts. 9. Naked Cakes: Beautiful, delicious and rustic, these cakes give off a more rustic, unrefined feel to keep things simple and romantic. 8. Breakfast-Inspired: Cinnamon roll wedding cakes, banana bread cakes, coffee cakes, or even waffle or pancake cakes make for a sweet statement piece. 7. Sprinkles: Make it fun with tiers covered in sprinkles of various colors…the perfect way to add texture and individuality to your wedding cake. 6. Metallic Masterpieces: You’ll find these in brushed, romantic hues that are sure to enchant your guests. 5. Square Cakes: Let’s get back to the 90s. Square tiers in alternating positions and in single and multiple layers are making a comeback. 4. A Unique Flair: Personalized monograms upon sugar plaques or in repeated patterns over the entire cake, unique shapes or individualistic themes are all setting couples’ cakes apart in 2017. 3. Drip Cakes: Color drips make a bold statement. With their mouth-watering, delectable attraction, they entice your guests to dig right in. 2. Hand-Painted Perfections: Whether they illustrate the story of your love through quotes or graphic design, hand painted cakes are reigning supreme in 2017. 1. Buttercream Beauties: Embracing imperfection in a perfect way, textured buttercream cakes are topping the charts for couples looking for beautifully delicious cakes that evoke a more relaxed, unrefined feel. When is a wedding cake not a wedding cake? When it is a table full of multi-faceted delectable desserts, of course. Have your sights set on a tower of colorful and delicious macaroons? Go for it! Personalize a tier of multi-ﬂavored wedding cupcakes or even a tower of donuts if you wish, instead of offering one single cake and ﬂavor. Or consider a table full of delicious homemade pies or individual tarts to highlight the freshest nuts and fruits available during your wedding season. I have design of cake and topper and recipe. It will be our renewal of wedding vows.